Cheesy Chongo's Cheap Chat: Spring Break.. PARTY! Ya, I partied like a mom to two kids. Some of the things on our party list this week: Monday we went to lunch with Ted at Liberty Park. Had Mcdonald's for lunch. 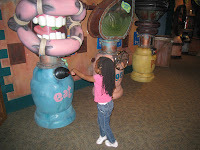 Tuesday we went to the Elmo's Body exhibit with my Sis and niece Tiffany. 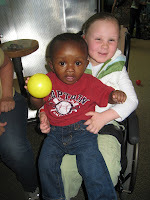 We met up with some of our friends from playgroup there too. For lunch we went to Del Taco. Wednesday we went to Chick-Fil-A for play group. Thursday was really cold so we stayed in our jammies all day. Had corny potato soup for lunch. Friday we headed back to Liberty Park and had Mcdonald's again for lunch with Ted. After we dropped Ted off we went to the mall and other stores till 6 o'clock and came home. We had so much junk food all week, but it was such a fun week. Doing things with my kids is so much fun. The Elmo's body exhibit was really fun. 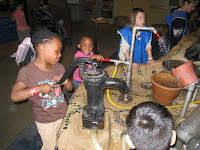 It was at the Childrens Museum. 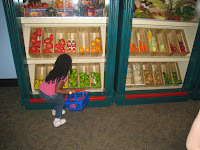 They had a little grocery market with plastic food and cash registers. Daesha loved playing in that area. Everything was all about your body. Everything had gross noises that made me laugh. There were things like what boogers are made of, why we fart, and lots of other facts about our bodies. The funniest was the digestive system. 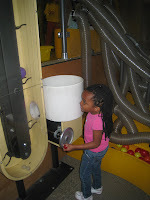 It starts with a big mouth that chews food as the kids would push the handle up and down. Then you go to the stomach and spin the stomach acid, and finally to the intestines where you push a button and a big poo comes down! Daesha was scared to see it. She thought it was real at first. 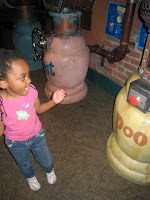 But when I told her it was fake she kept going back to push the button just to see the poo come out. I was laughing at the gross stuff and Daesha didn't seem to think it was very funny. But even if she thought is was too gross she was intrigued. 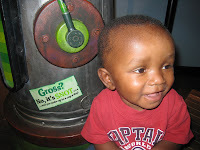 I had to take a picture of Keegan by the snot machine. It reads "you make up to 1 cup of snot a day" I am pretty sure Keegan exceeds that amount. 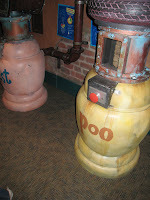 that sounds just like grossology that was at our children's musuem a while back and gage was so scared of it! haha! we laughed at him each time, it was pretty gross stuff though! Was the Elmo exhibit just for one day, or is it still there? Sounds like a busy week but alot of fun!! What a fun day, your a fun Mom. I will be calling you to learn how to change paper now that I have my computer back. 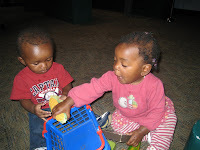 WOW, what cute playgroup friends you have! :) We had fun meeting up with you guys. If you're ever down this way having lunch with the husband and need an activity afterwards, give us a call. We are always up for an adventure. 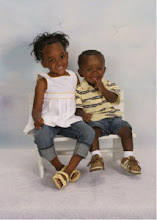 ahhhh your kids are so friggin cute!